Tree Tops Restaurant at Banyan Tree Bintan have pleasure in hosting the inaugural "Best of Bintan 2019" Culinary Event on Saturday 19 January 2019. "Best of Bintan 2019" is a collaboration of the six best chefs from several hotels on Bintan Island, who will present a one-time special degustation dinner comprising a six-course tasting menu, showcasing the best signature dishes from around this unspoilt island in the South China Sea, just an hour by ferry from Singapore. The dinner's main aim is to promote Bintan as a truly world-class culinary destination, incorporating authentic flavours of Indonesia, with innovative flair. 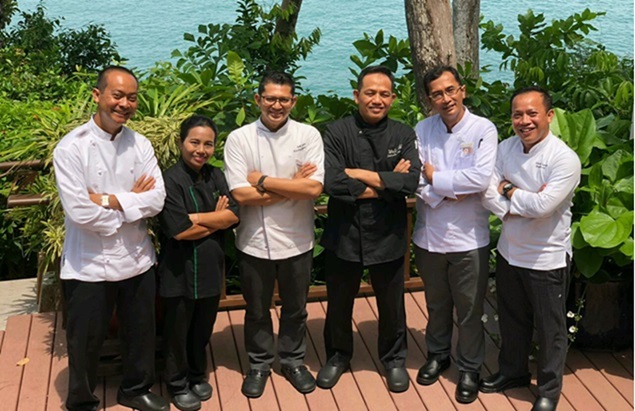 The six passionate Chefs, who will be working side by side to serve a selection of gourmet offerings are: Mr. Yudhistira Angga Tirta, Executive Sous Chef Angsana Bintan; Ms. Ni Luh Ratnawati, Pastry Chef Banyan Tree Bintan; Mr. Adli Nizam, Executive Sous Chef Bintan Lagoon; Mr. Wali Amrullah Abbas, Executive Sous Chef Nirwana, Mr. Singgih Kisworo, Executive Sous Chef The Canopy Bintan and Mr. Lambok, Executive Chef The Residence Bintan. Look forward to a sensational 6-course dinner featuring local favourites from the Riau Island!